Hair Transplant in Delhi – Hair transplant is a completely scientific procedure. The donor area is resistant to the miniaturizing effect of DHT. Thus, hair taken from this portion will usually not fall off in the lifetime of a patient. This hair is then transplanted in the area of baldness in a natural and dense manner to give a perfectly natural appearance. 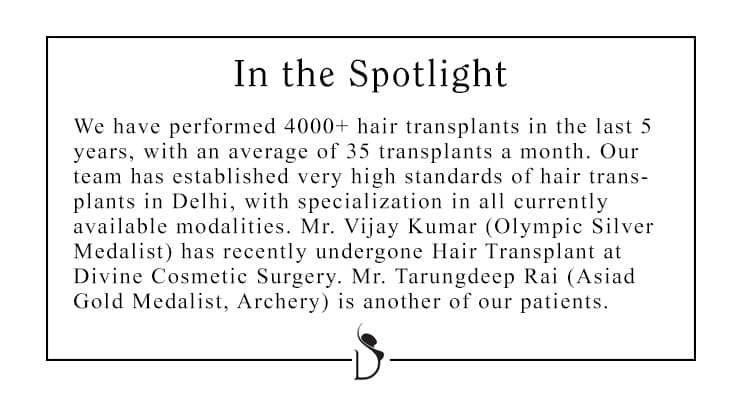 Hair taken from the donor area grows in the bald patches as well as in the area where density increase is desired. This growth is lifelong and patients require hair cuts as well. No special maintenance of this hair is required as this is your own natural hair. Best Hair Transplant in Gurgaon – Hair loss is distinct from hair fall and is invariably non-recoverable. Male pattern baldness (MPB) or androgenetic alopecia is responsible for the vast majority of hair loss in men. People with MPB inherit hair follicles with a genetic sensitivity to dihydrotestosterone (DHT) – a derivative of the male hormone testosterone. These sensitive follicles have receptors at their roots which interact with DHT and resultantly go through the miniaturization process. In women, the underlying reasons vary, from androgenetic alopecia to PCOD or even thyroid imbalance. The classification of balding in men (Hamilton-Norwood) and in women (Ludwig) are as depicted. The best hair transplant clinic in Delhi being amongst the most common cosmetic procedure treatment is surrounded by many myths and misconceptions. There is a huge amount of confusion amongst the hair loss patients regarding the choice of clinic, choice of doctor, choice of technique, assurance of results, quality of service, etc. we will try to simplify the situation and clear some of the myths. For someone who has a large bald patch. Can be combines with FUT for a large bald patch. This is because there is a higher wastage of grafts with FUE in subsequent sessions and the lifetime harvestation of grafts with FUE is less than that with FUT. FUT is a more complex procedure. FUE is simpler as compared to FUT, hence requires a smaller team. FUE is not indicated in thin, thin curly and very curly hair, due to higher wastage. Plastic Surgeon versus Dermatologists/ MBBS/Dentists/Radiologists, performing best hair transplant in Delhi. Plastic surgeons are trained in hair transplant in their training, and are more adept at performing surgical procedures than other doctors who do not know too much about procedure. Training , experience and not financial reasons should be the criteria to do hair transplant. Always select Plastic surgeons to perform your hair transplant to assure better results. Hair transplant is not a temporary procedure. The hair that is implanted is for life, and unless the doctor has harvested hair from a temporary zone the hair is bound to stay for life. This is because the hair in a fixed zone is resistant to the effects of DHT , thus removing the influence of the agent responsible for hair loss. A large number of women benefit from a hair transplant. Young women opt for this to lower their hairlines. Middle-aged and older women do hair transplant to increase their density in the front and sides. Results in women are as good as in men for hair transplant near me. Easily one of the biggest myths. The best surgeons belong to India. Celebrities make doctors in Dubai and LA more famous than others, but they are not necessarily better. In addition are the higher costs, need to travel. We at Divine Cosmetic Procedure today pride in our results, and our clientage boasts of ambassadors, ministers, International celebrities, sportpersons. They trust us since we know the nuances of how to deliver.